For drone mapping applications that require absolute geo-spatial accuracy REMOTE EXPERT provides full processing with the use of GCPs. 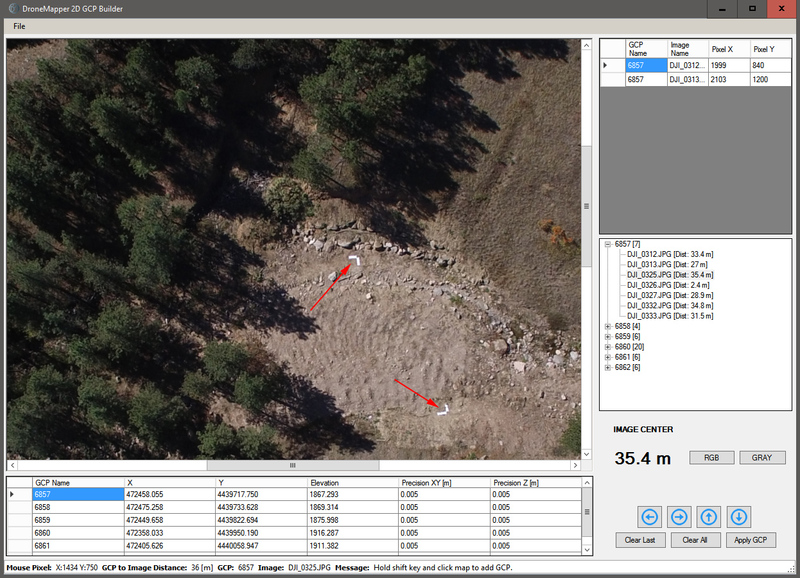 There are two additional files required along with the project imagery to make full use of this important function. 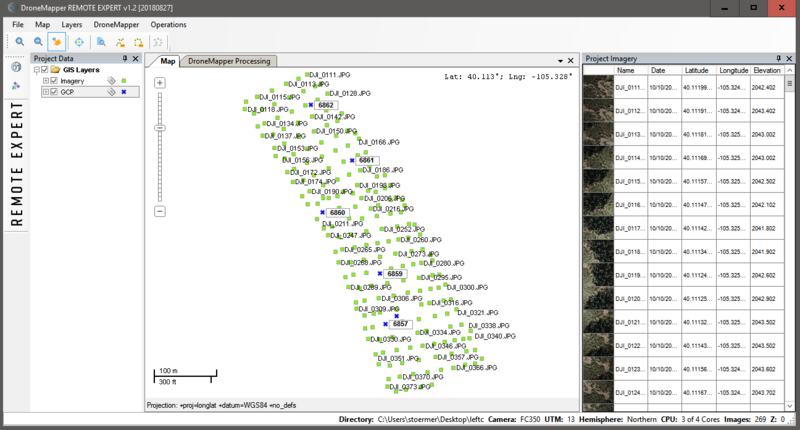 The first file is the DroneMapperGCP_3D text file. This text file contains 6 columns of data, each row spaced delimited. Let’s look at the first row: the first entry is the GCP name (6857), followed by a space. The second entry is the easting coordinate in UTM (zone) WGS84, meters (472458.055), followed by a space. The third entry is the northing coordinate in UTM WGS84 (4439717.750), followed by a space. The fourth entry is the elevation in meters (1867.293), followed by a space. The fifth (horizontal) and sixth (vertical) entries are the survey precision (0.005), separated by a space. This point was surveyed with an accuracy of 5 mm. Each GCP to be used in processing is listed in the remaining rows. 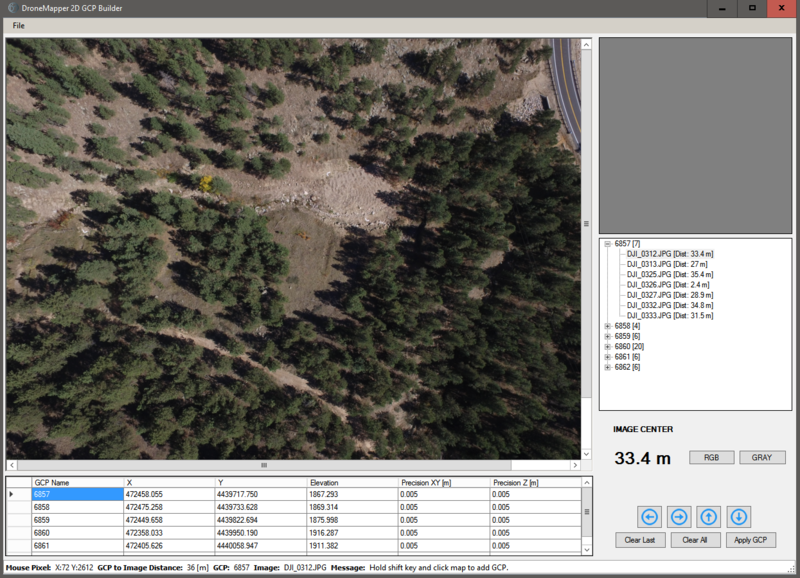 Once completed, save this file as DroneMapperGCP_3D.txt within the project imagery folder. The inside corner of the “L” was selected as the surveyed point. At the top right hand corner of the screenshot the pixel selected in that image is recorded. After selection of the pixel the next image in series for that GCP is displayed. The same process is repeated until all images for that GCP have had pixels identified. The blue down arrow is pressed to move onto the next GCP and the process repeated until all images are associated with GCPs and image pixels have been selected. Once completed click on the “Apply GCP” icon and the DroneMapperGCP_2D text file will be written to the project image folder. Here are a few tips/suggestions/cautions to help quickly generate the GCP 2D file without errors. One error in the file generation will cause processing to abort. You’ll see a sandy wash area with GCP 6857 on the north side near a few rocks. Another GCP, 6858, is south (near the center of the image) in the sandy area of the wash. Because the GCPs are so close multiple images will contain both – correct identification in each image is critical. One method to help identify the correct GCP is to utilize the estimated distance from frame center (shown in parenthesis) next to each image in the list. Scroll down to the image with the smallest distance and confirm the GCP is near frame center. Take note of any features around that GCP so that it is positively identified in each image it appears. For this example, the imagery was acquired at 5 cm GSD using a 12 Mpixel format sensor. 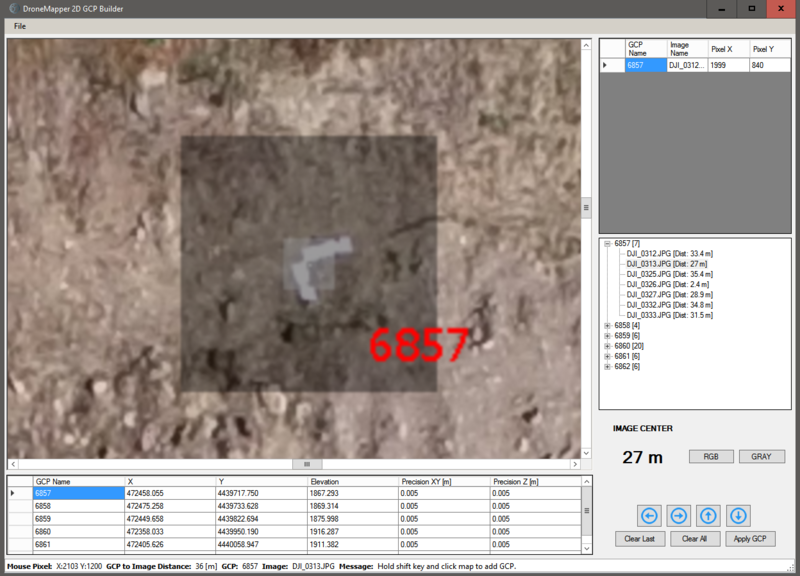 The distance slider was set to 80 meters and resulted in approximately 30 images identified with each GCP. If the slider is set to 50 meters approximately 10-15 images would be associated with each GCP, making the pixel selection process more efficient. In any case, at least 5 images should be associated with each GCP. Make sure aerial targets are large enough (compared to expected GSD) and their geometry is unambiguous as to where the surveyed point is. In this example, white surveyor tape 6” wide by 1-2’ long is used in an “L” configuration. The inside of the “L” is the point that has been ground surveyed and used consistently in picking image pixel location. At least 3 pixels (GSD = 2”) fall across the target width and many more along its length to resolve the target. Observe where the GCP is located within each image frame. You want to use the GCP and associated image when the GCP falls within the central 75-80% of the image frame height and width. Skip the images that have the GCP near the frame edge or border assuming you can still meet the minimum 5 images per GCP.